Well, I suppose you could also throw in a lemon wedge or two – that is, if you truly wanted to. But in any case, it seems the good people over at Perrier feel it’s time for the quintessential “Gin and Tonic” to become a thing of the past. According to this week’s NY Metro , when’s the last time you ordered a Vodka Perrier? A Gin and Perrier? 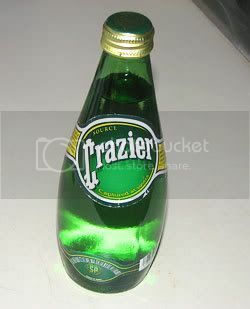 Or, make that a bottle of "Craz-ier" ? Read more here at NY Metro’s Grub Street about this new-aged take on many of the old standard bar drinks that were recently served at Fontana’s here in New York. Gotta love those splashy new Perrier drink coasters too. Totally "clever-ier," no doubt. Along with editor-in-chief, Tanya Wenman Steel, the well-known Epilog blog will soon have a star-studden roster of contributors. Heading the list, will be one of my favorite Tex-Mex and Southwest fusion chefs, Rick Bayless, writing mainly on "chefly" topics, and Melissa Clark, who will be concentrating more on cookbooks and recipes. This well-rounded roster will also include Red, White, and Drunk All Over author Natalie McClean, who’ll be discussing...well, of course, the joys of alcohol. With Amy Sherman, and Michael Y. Park on the Food News and Gossip beat, this new formatting should be, at best, as interesting and helpful as it will be entertaining. And although I did appreciate the musings of Tanya Wenman Steel as the “Overcaffeinated Editor” (what she used to call herself at Epilog), I have to admit this revamping sounds totally fresh -- and inviting. 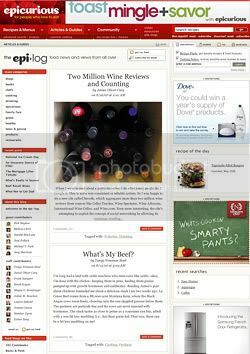 Quickly becoming a favorite among wine lovers on both sides of the pond, the Virtual Wine website contains a growing library of Virtual Wine Tasting Clips, wine tips and advice, and is a place where wine enthusiasts can share ideas and debate hot topics. In short, it’s a totally innovative UK media company that produces and broadcasts live Virtual Wine Tasting events over the internet. The events can be joined by any registered user and the site's Virtual Tasting Room also allows participants to chat with an expert panel and other participants during these events.